The Vikings' mascot delivered holiday wishes to fans on Sunday -- including one very special one to Brad Olson and his family. MINNEAPOLIS — The game itself may not have been beautiful for Vikings fans – a 38-7 drubbing at the hands of the Seattle Seahawks – but a beautiful holiday moment took place in the fourth quarter in Seat 6, Row 31, Section 222 of TCF Bank Stadium. There sat Brad Olson, a local high school teacher, wearing a Vikings jersey and cheering on his team in the blustery Minnesota cold. He brought his 10-year-old son, Eli, to the game, while his 8-year-old daughter, Ella, stayed home. 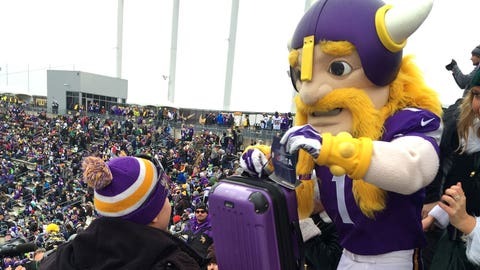 Down the stairs came Viktor the Viking, Minnesota’s mascot, accompanied by a few of Santa’s elves and holding a purple suitcase. It was a gift from the Minnesota Vikings: two round-trip plane tickets to Columbus, Ohio, where Olson’s daughter – who has suffered with life-altering colon problems since doctors found a tumor in her abdomen when she was 6 months old – will be visiting a specialist in January. Thanks to the Vikings, Ella Olson will have company on her January trip to visit a doctor in Ohio. For the second straight year, the Vikings granted holiday wishes to their fans. Folks at the game tweeted their seat location, their wish and the hashtag #VikingsWish, and 15 fans were granted their holiday request live in the stadium during the second half. Olson tweeted his wish to the Vikings because it was the only Christmas present he wanted. His daughter has had a half-dozen surgeries to help correct her ailment, called currarino triad syndrome, but she has gotten worse recently. 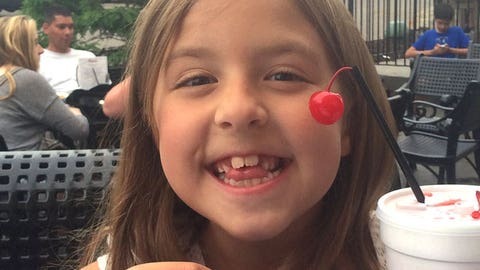 More than half of Ella’s school days, the third-grader heads to the school nurse because of colon motility problems. She has to self-cap her bladder four or five times daily and has to spend nearly an hour a night flushing her bladder through a belly-button stoma. She’s 8 years old and insanely cute, and frankly, she’s sick of all this. Last week, the Mayo Clinic hooked the Olsons up with Carlo Di Lorenzo at Columbus’ Nationwide Children’s Hospital. He is one of the world’s leading experts in the disease. But since Olson’s wife has taken a leave of absence from work at a suburban Minneapolis elementary school to care for Ella – and since the family has reached its out-of-pocket maximum the past several years with their insurance – they weren’t sure if they could afford the trip. “We’re just looking for answers,” said Olson, a 10th-grade world history teacher at Wayzata High School. With the two round-trip tickets, Olson said the family will go to Columbus in January to visit the specialist. It’ll be an 11-day trip, and they’ll stay at the Ronald McDonald House.